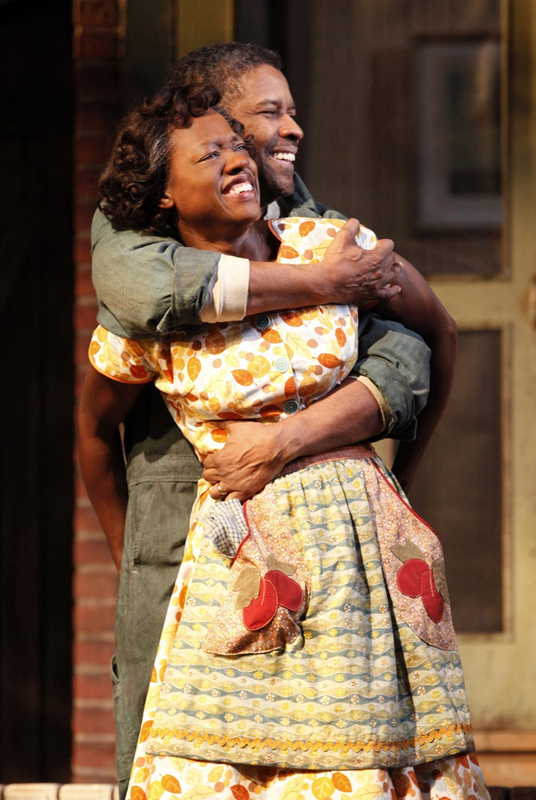 Viola Davis and Denzel Washington reprise their Tony-winning roles as Rose and Troy Maxson in the film adaptation of "Fences." Photos courtesy of Paramount Pictures. NEAR the beginning of "Fences," Troy (star, director and producer Denzel Washington) delivers a long monologue during a backyard scene. My first thought was "Oh, Lord, it's going to be a play on the big screen." I wasn't prepared for this, thus prepared to be bored, for "Fences" is a very loquacious play. It feels less like a play as the film unfolds, but never sheds that imprint. This is intentional. "Denzel went back to the original screenplay, and he wanted to stay close to spirit of the stage play," Constanza Romero disclosed to the New York Film Critics Online (NYFCO) after its screening of "Fences" at Walter Reade Theater. 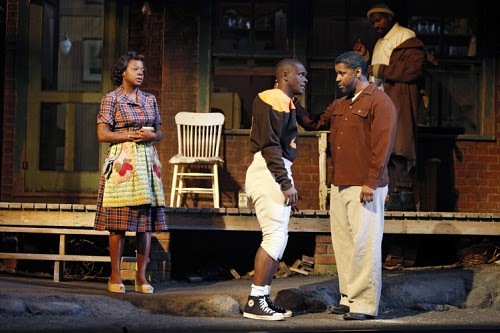 CR, a Tony-nominated costume designer, is the widow of August Wilson, the creator of "Fences," the Pulitzer Prize-winning play from which the film is adapted. When DW phoned to get her blessing to direct the film version, she said she obliged. "I felt like a green light all the way, " CR said during the NYFCO Q&A. 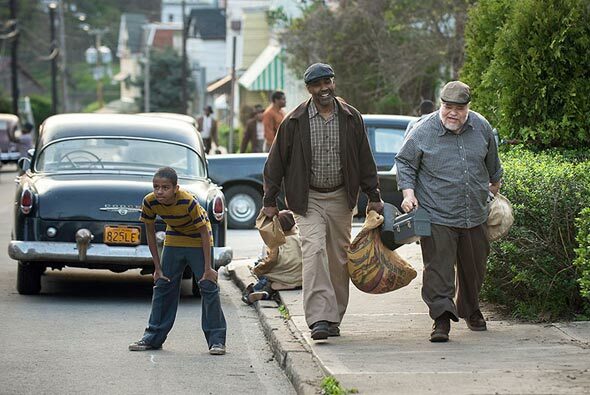 "Fences," AW's slice of Americana set in 1950s Pittsburgh concerning the life of Troy Maxson, a onetime baseball great and garbage collector, as well as his family, opens widely on Christmas Day. For those laboring under the assumption that "Fences" marks DW's directorial debut, it does not. That distinction goes to "Antwone Fisher." It has taken a while for "Fences" to come to the big screen mainly because of AW's edict that it be directed by a black person. He produced a script, which was touched up by an uncredited Tony Kushner. In his third outing as a director, DW excels, particularly with himself by not overwhelming the proceedings with his consequence as the main character. The pacing is brisk enough. "Fences" does not seem overlong at 139 minutes. Characters have organic movements, seamlessly distractimg from all of the talk, for "Fences" is a loquacious film. Emotions are on a tight coil, though the medium of film allows the players to let it rip. The camera subtly lingers on important details, such as an image of Pittsburgh steelworkers sans any black men, without looking askance. No doubt, DW admonished production designer David Gropman to keep the sets spare in deference to his source material. Surely, he had the budget to be more lavish. The tension present in the play is as papable on screen. Viewers will find it difficult to watch at their ease, for almost every interaction is a tinderbox on the point of exploding. Even the most innocuous-seeming, as when best friend, Jim (Stephen McKinley Henderson), tracks Troy to a favorite haunt where they have a conversation heavy laden with meaningful nonverbal communication. Troy (Denzel Washington) and Jim (Stephen McKinley Henderson) return from a day's work in "Fences." Incidentally, the performances are generally stellar. The actors deliver like cogs in a well-oiled machine. All of the principals are reprising their Broadway roles, except the two youngest, Cory (Jovan Adepo) and Raynell (Saniyya Sidney). Virtually every scene is powerful and significant. Two in particular stand out. The one between Troy and youngest son, Cory, is one. The boy stubbornly refuses to exhibit the manners he has been taught - Strike 3. Consequently, Troy is forced to demonstrate who is the man of his house. A young lady with whom this reporter chatted during the reception following the film's New York premiere (at Frederick P. Rose Hall, home of Jazz at Lincoln Center Rose Hall) at Tavern on the Green, judged Troy's treatment of his son harsh. Point taken, Father might have spared the rod a bit more, after all, the boy was not without some righteous indignation. Further, the punishment did not fit the crime. However, the young pup needed to be taught some facts of life. 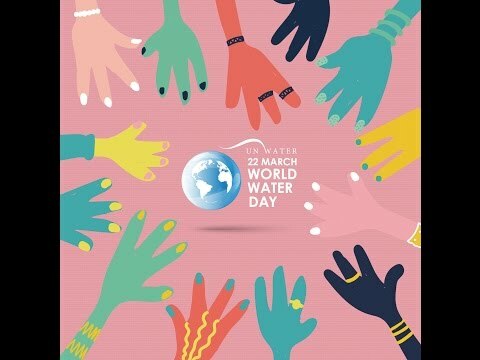 Specifically, some respect; a non too-gentle reminder about who pays the bills; a refresher on to whom he owes his surly, ungrateful existence. Rose (Viola Davis and Gab (Mykelti Williamson), far left, are spectators as Cory (Jovan Adepo) and Troy (Denzel Washington) talk football. The other scene is Rose's (Viola Davis) confronting Troy about the fallout from his infidelity. Her dissertation is so passionate that viewers will be jolted by her pain, anguish and fury; an utter betrayal of one who has been unwaveringly loyal. "In all of his plays, August tried to pay homage to his mother, CR responded when I asked her whether he would be pleased with the film. The short answer is yes. However, she alluded to the aforesaid and a companion scene by way of a fuller answer. "He was very reverent of his mother," she added. "Fences" is an important work in the pantheon of American artistic expression and important for numerous other reasons. My preference is that it remained a play only. Alas, as such, far too few would have an opportunity to see it. As a film, it opens up to the world. One hopes the world will embrace it. Jim (Stephen McKinley Henderson), Troy (Denzel Washington) and Cory (Jovan Adepo) in the Maxson backyard where a fence construction is in progress. "Fences" has myriad teachable moments. About dreams destroyed. About extremely limited opportunities sanctioned by the State. About injustice. About the basic unfairness of life. About brokenness. About forgiveness. About love. About the black experience in America. About black history. About American history. Just as important, it is a fine entertainment, showcasing fine performances. "Fences" is rated PG-13 for thematic elements, language and some suggestive references; visit www.fencesmovie.com to learn more about the film. It must be a bigger one.Fencing around shooting spot helps a lot from unwanted conseqences.Vinyl Fence Calgary is a good one for fencing. Setup in a screenplay should establishe World, Characters, and Theme leading to the call section with small revelations, foreseen new situations and a glimpse of living a full life. The conflict should be established in the first 10 pages. All the main players should bet revealed early enough. Setup should show a place, a time, a mood or the point of view. Vist My Website Putlocker and you can https://putlockeron.com/ here in HD Quality without any disturbance.